Some UIUC students may be surprised to find when they walk into their African-American music class that their professor is a white man. “I know that I have some sort of double takes from students when they walk in and see me the first time,” Professor John Paul Meyers said. Meyers is a visiting assistant professor in the African American studies department who identifies as white. His educational background is in ethnomusicology, and he teaches not only a course called African-American music, but also a course called Black Music and Social Justice. However, Meyers is not exactly an anomaly. Far from the only white professor to teach topics of race and diversity at the university, Meyers is, in fact, one of seven white professors to be listed as core faculty in the African-American studies department. Race and diversity-related courses became a popular topic of discussion on campus in the spring semester of 2016. In May, the UI senate passed the Chancellor’s Committee on Race and Ethnicity’s proposal to change the general education requirement from taking either a U.S. minority culture course or a non-western culture course to making both a requirement for students starting in Fall 2018. Despite the upcoming increase of students taking courses on U.S. minority and non-western cultures, there are no mandatory diversity trainings for professors who teach these types of courses, according to Associate Chancellor for Diversity Dr. Assata Zerai. Diversity-related trainings and committees vary by each academic unit, Zerai said via email. According to Ross Wantland, Director of Diversity and Social Justice in the Office of Inclusion and Intercultural Relations, because there is soon to be an increase in students taking these types of classes, reflecting on whether these classes are taught in effective ways is important. Wantland himself is a white professor who teaches on topics of race and diversity. He is a lecturer for PSYCH 496 - Facilitating Intergroup Dialogue. He said that, as a white person, he has to be aware of his white privilege and taking accountability for that. Meyers said that listening to contributions student of color voices in class is key. “I think that that is particularly sort of important for white professors teaching about these issues, and understanding that we may have an academic understanding of some of these issues, and we may know the literature quite well, but there’s a difference in lived experience,” Meyers said. Other professors admit that they have not thought as much about their white privilege. Nils Jacobsen, professor in the Department of History, is teaching a Latin American History class this semester. He said that he does not have a very acute awareness when it comes to considering his white privilege. According to a “Racial Microaggressions Report” that came out in 2015, over 51% of students of color on campus who participated in the survey said they experienced stereotyping in the classroom. Over 27% of students said that they were made to feel inferior or that their contributions were minimized because of their race. Stacy Harwood was one of the principal investigators of the Racial Microaggressions Report. She said that when students of color confront professors about microaggressions on campus, they often felt unheard or dismissed. John Smith, a senior in engineering that identifies as Turkish and Muslim, recalls listening to a student in his Class and Race in America class make a broad generalization about Turkish people who join ISIS. He said that his white teacher did not challenge the student’s statement. One student, Jane Doe, a freshman who identifies as a multiracial Latina, said that all her teachers, save for one lecturer, are white this semester. She said that students of color are always going to have to brace for a professor saying something upsetting. 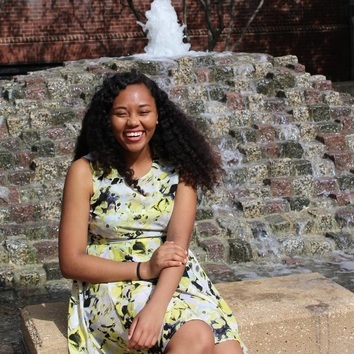 Although she finds it important to confront professors in situations where microaggressions may have occurred, she said it is not always possible to address the situations in class. Harwood said that these types of interactions can have a negative effect on students’ learning experiences. Students also report that having a professor of color teach them about race would be beneficial to them. Jane Doe said that she was surprised that inoa white professor was teaching one of her classes on race. Adrian Burgos, Professor in History and Latino/a Studies, cited an incident that occurred last year when explaining the importance of having professors of color. In April 2016, unidentified students chalked Pro-Trump, anti-immigrant rhetoric in front of the Latino/Latina Studies building, an act that Burgos said many felt was a targeted attack. At this time, he was teaching a course called Latinos and Cities. “My students were hurting. They needed a space, an intellectual space, not just a space of counseling. A space where they could articulate the very real lived and psychological dimensions through what they have studied - application of their education,” Burgos said. 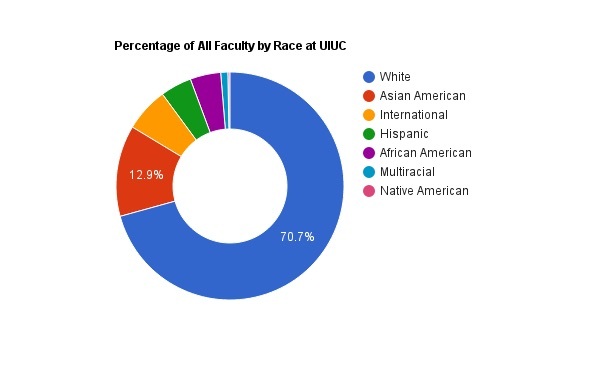 As of Fall 2015, 70% of total campus faculty is white. Asian-American faculty make up 12.8% and Native American faculty make up .3%. African-American and Hispanic faculty make up 4.3% and 4.4%, respectively. Professor Burgos said that one of the reasons that there may be a lack of professors from historically disadvantaged groups is because of the campus climate surrounding race and diversity. He spoke about the challenges facing retention of faculty members from historically disadvantaged groups. “Illinois desires faculty of color, most universities on a certain level do. There’s this early period of welcoming and romance and stuff, “We really want you at Illinois!’” Burgos said.